St. Louis County Police released two more videos of last night’s police shooting in Berkeley, Missouri. 18 year-old Antonio Martin had a criminal record, with charges including three assaults, armed robbery, armed criminal action and multiple uses of weapons… since he was 17. On Tuesday night Antonio Martin drew a gun from his pocket and pointed it at police. He was shot dead by the officer. The attorney for the Berkeley police officer said this bizarre scenario may have been a set-up at the store to kill police. ** Antonio Martin and his companion stole from the store before the shooting. 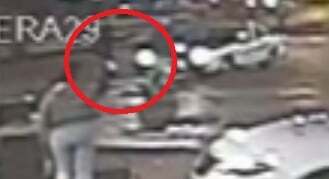 County police released video of a second angle to the shooting death of Antonio Martin. And a third video shows the officer retreating and falling to the ground during the shooting. Protesters were back out on the streets of St. Louis Christmas Eve.